Home Our Dogs Hello Tucker!! 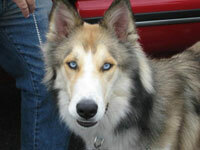 This handsome boy is a Husky/Collie mix and is just 8 months old. He is a sweet and playful pup who is making friends with everyone he meets! Tucker’s family fell on hard times and couldn’t provide a proper home for him. His family is heartbroken that they could no longer keep him, but they felt they had to do what was best for Tucker. He stayed overnight with one of our volunteers and will make his way to his foster home tonight. Since he just came in last night, we are getting to know Tucker and will post updates soon!